A few years ago, a coworker posted some photos of Sandhill Cranes at her farm on facebook. I was gobsmacked - I'd had no idea that these huge, striking, scarlet faced birds could be found in Ontario. A year or so later, camping on an island near Killarney in Georgian Bay, we heard the eeriest sound, like dinosaurs flying overhead and then, there they were through the fog: a small flock of Sandhill Cranes, just visible through the mist on the island across from us. I ran to my tent for my camera and quickly changed to a telephoto lens, ran back to the shore, set up my tripod, secured the camera, bent to look through the viewfinder AND....the skies opened and let loose a torrential downpour. By the time it let up, the cranes were gone and did not return during our time there. 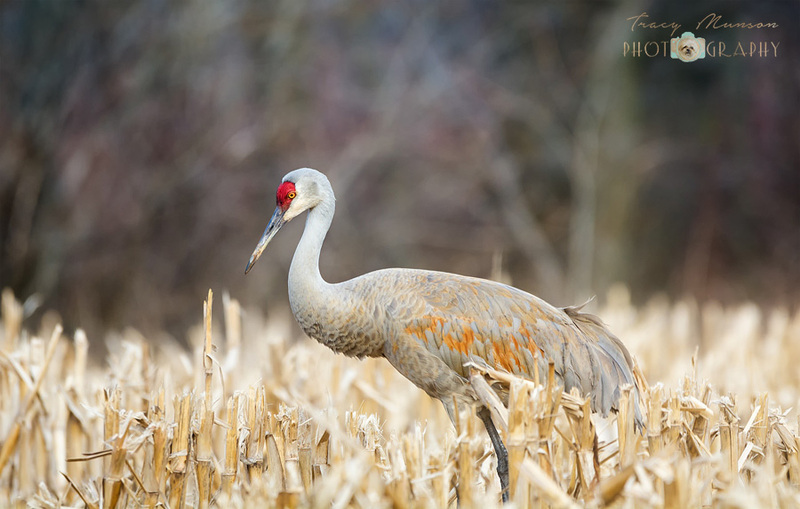 Two years later, my photography buddy and birding guru, Natalie Robertson texted me: did I want to go see if we could find the Sandhill Cranes that the birding forums reported near Cambridge, ON? Well, hell yeah. We set out with our long-suffering partners/sherpas in tow and came back very happy with our captures of the day!